Kingdom of Forty Castles is in trouble. Mech Lord, a master of Iron Monsters, prepares to destroy people of the Kingdom. 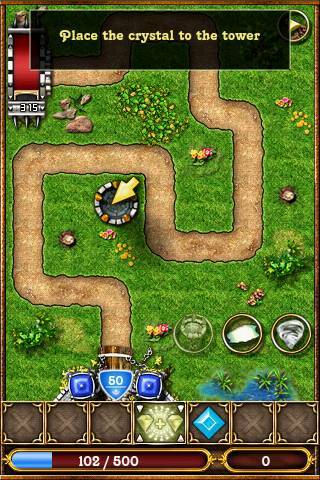 Monsters come out from Underground Forges and run to the castle. Underground Forge produces Iron Monsters, wave by wave. It has a wave indicator that shows the order number of the next wave and time remained before it will be activated. Also you can see monsters type, quantity and average health of this wave (just hold trackball or CAMERA button and touch wave indicator). 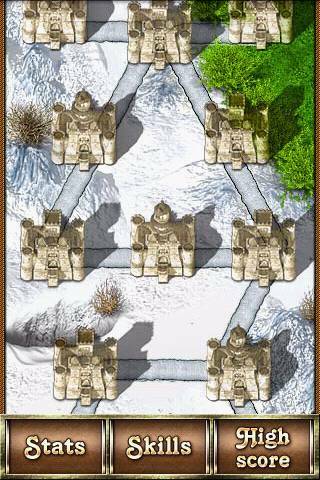 Your goal is to destroy all the monsters before they reach the castle and break the Magic Shield. 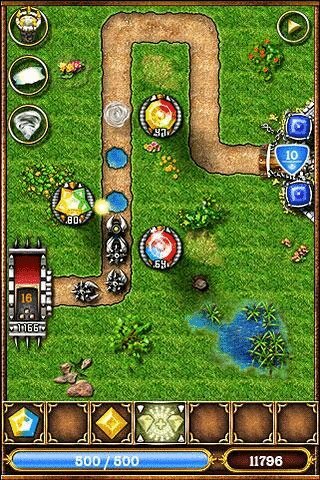 Create Magic Crystals, plug them into towers, and they will shoot at monsters. 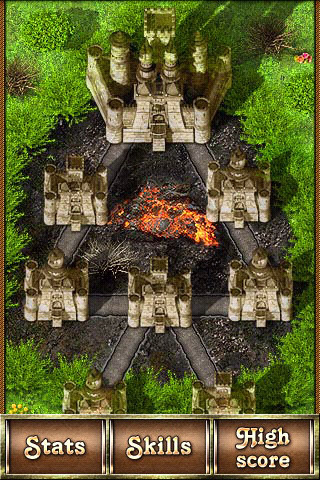 You can also build new towers and other objects, mix and enchant Crystals etc. (see below). Waves with bosses have less quantity of monsters (1-3) but they are very strong and resistant to vortexes (e.g. vortex has less chances to turn them back). 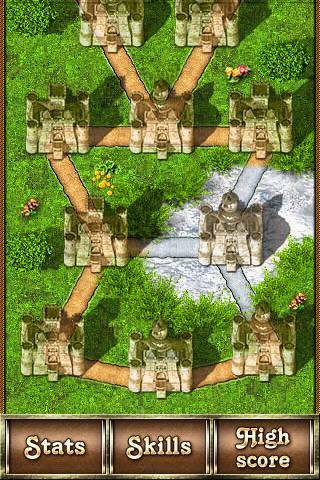 Each castle is protected by Magic Shield. 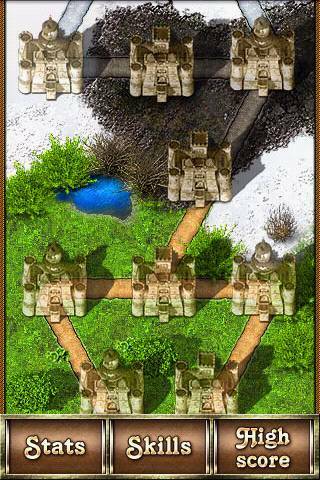 Initially it has a number of defense points (depends on "Defender" skill, see below). 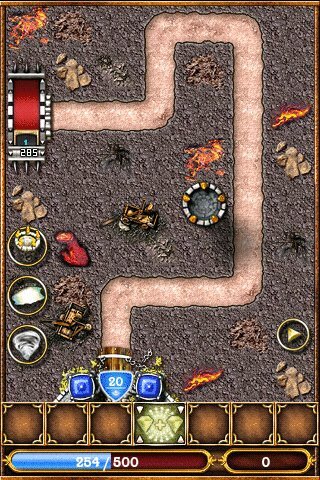 Each monster reduces current amount of defense points by certain quantity specified in monster details (hold trackball or CAMERA button and touch monster to see details). 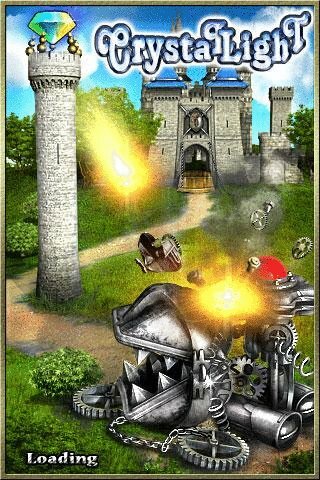 If monster reaches the castle and Shield has not enough defense points to resist monster then the battle is lost. But you can reinforce defense points by touching the shield. 1 defense point costs 10 mana. For each killed monster you receive score points equal to monster total health points (as well as some mana). 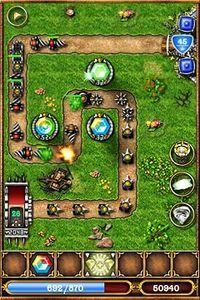 In the bottom of the screen you can see Mana and Score indicators. Above it you can see crystal creation pane. Tap Underground Forge to force the next wave. 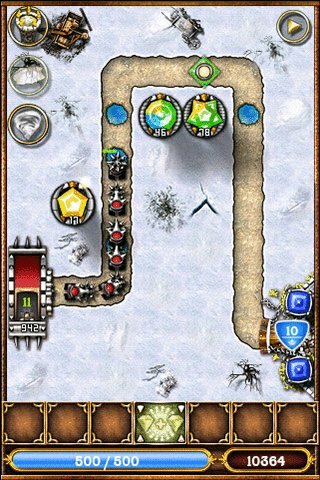 Tap Magic Shield to add more defense points. You can control speed of time flow by using the time button which has two conditions. Touch the Crystals palette and then select what type of crystal you want to create. Crystal types will generated randomly. 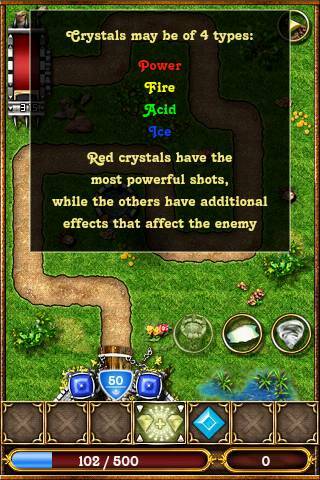 Power of shots and all effects will grow while mixing crystals. You can see all Crystal details at any time (hold trackball or CAMERA button and touch Crystal). The central large cell called Magic Cell. Use it to mix Crystals. Power and effects of mixing Crystals are merged. When crystals of the same color are mixed, they merge their attack power and effects with better result, but when you mix crystals of different colors you create crystal with multiple effects. Note that the nearer power of mixing crystals, the better mixing result. Use enchant menu to turn crystal into mine.It’s a powerful weapon of mass destruction within Crystal range. 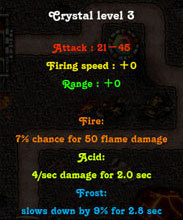 Its damage based on power, level, firing speed and effects of the Crystal. Select crystal, press Mine button and click somewhere on the road. 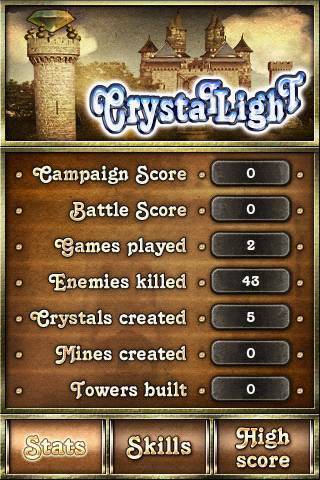 Crystal will turn into mine and when any monster reaches the mine, it bursts. By default waves of monsters go one by one. But you can force the wave: tap the Underground Forge. You’ll get much score points for all spared time, but the wave will be activated almost immediately and battle will become harder! Each next forced wave will give you more points per time than previous. Wave forcing is necessary to get an Award! Spend Mana to create and ehchant crystals, build towers and puddles, summon vortexes, and increase defense points. You receive mana by two ways: from each killed monster and with the course of time (mana regeneration). Be careful: if mana storage is full, received mana will be lost. So spend mana in time. 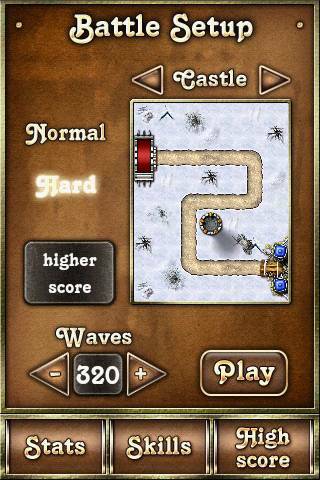 In this mode you’ll pass 40 castles from 20 to 120 waves and finally defeat Mech Lord. We called castles by names of famous medieval castles. There are some interesting features in campaign mode. 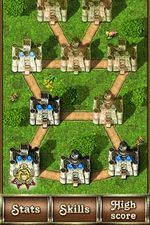 You can pass any castle again to achieve better result in this castle. 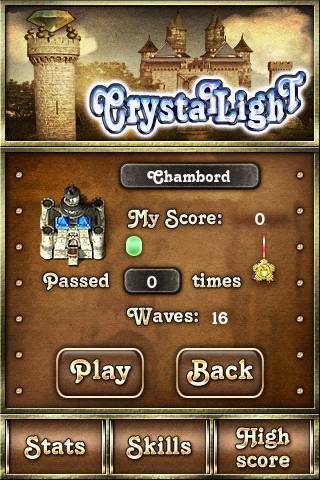 For instance, you can pass again the first castle with upgraded skills that allow you to force waves more intensive and to get more score then the first time. 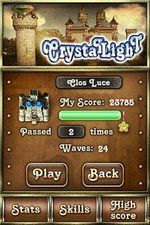 If you’ll receive less score point than current result then your score for this castle stay unchanged. 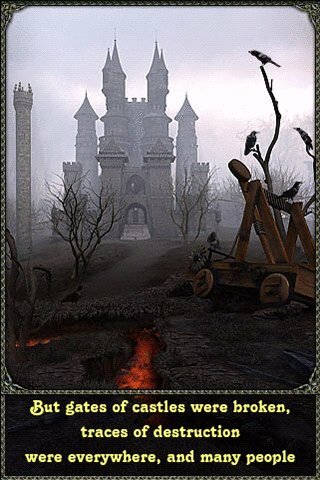 After you pass a castle you’ll receive 2 skill points (once for each castle). You can accumulate them to upgrade your skills. 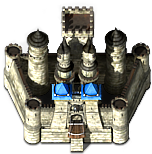 Also, if you’ve got enough score you’ll receive an Award for this castle and 1 additional skill point! 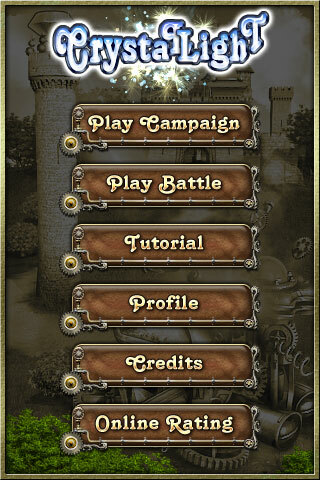 Your total campaign score is sum of current score for each castle. 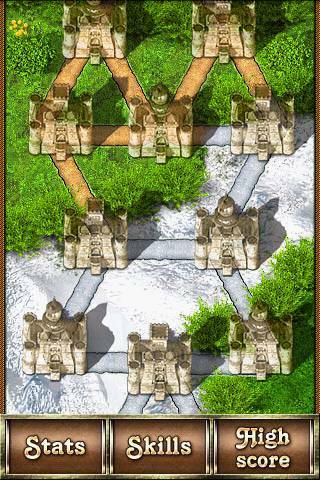 In this mode you can select a map, a number of waves (10-260) and hardness yourself. All of your skills that you’d upgrade in Campaign mode are allowed in this mode too. So you have more chances to be on top of Battle score table if you choose maximal number of waves, hardness and your skills are upgraded enough. This mode teaches you how to play and gives you a brief info about game basics. 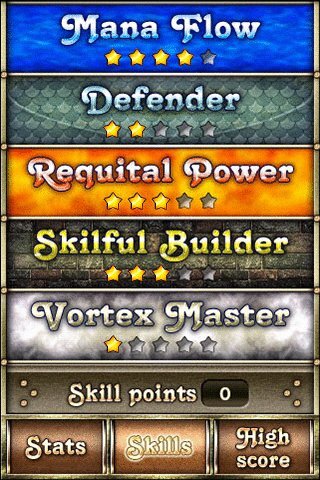 Use received skill points to upgrade your skills and become more powerful mage. You can learn detail description of each skill by touching it when you hold trackball or CAMERA button. Another attractive feature of this game is extensive online rating system. All players’ profiles are synchronized with our server and therefore you can see your current rating in real-time. In game you can explore full score tables. 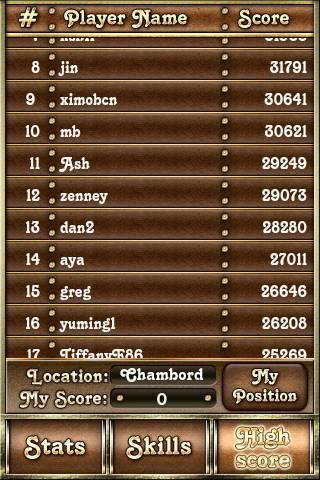 Press High Score button to see score table. You can see Campaign score table if you play in campaign mode and no castle is selected (you are on map). 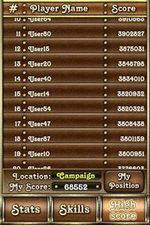 In Battle you’ll see Battle score table. Slide your finger to scroll score table or press "My position" button to rewind to your position in this table (but if you haven’t pass the castle yet then you have 0 score and you’re not rated in score table). As profiles are synchronized with online storage, we’ve added a special feature to the game: you can restore all your profiles (7 as maximum) if they were lost! For instance, you played the game and then uninstall it (when uninstalling, all game data is erased). If you’ll install the game later, you can restore all your profiles and play next! It works only if you use the same phone. To restore profiles enter Profiles page in the Main menu, then hold trackball for 3 sec. If your phone have been running for a long time, about a week or so, Android may behave strange. It became laggy and doesn't wait for apps to save their data. As a result when you exit game by HOME button and then restart it, game may read wrong data and "force close" dialog may appear. To avoid "force close" dialog next time start the game holding trackball button before it loads completely, then release trackball. In this case game "forgets" previous unsuccessful saving and loads menu.